It’s quite extraordinary to think that it’s now 20 years since Chinese students and much of Beijing – then still Peking in BBC-speak – rose up and occupied Tiananmen Square to call for democracy and an end to corruption. I have a picture somewhere undiscoverable of a much younger MB standing on pretty much the same spot as here two decades ago, posing with BBC microphone among crowds of hunger-striking students as I reported on possibly the biggest news story I’ve ever covered. After serving there from 1984-87, I was back in Beijing at the time as the BBC World Service’s London-based Diplomatic Correspondent to report on what was intended as a groundbreaking visit to China by the then Soviet leader Mikhail Gorbachev. Groundbreaking it was, but in dramatically unexpected ways, as China was shaken by its biggest protests since the Communists came to power in 1949. My successor as Beijing correspondent, and now Economist correspondent there James Miles, has just broadcast a riveting account on BBC Radio 4 of those euphoric but ultimately tragic days, digging out priceless old recordings with the help of editor Caroline Finnigan, and of our good friend and producer in China in 1989, Peter Burdin. James makes the cautious point which my wife Sue and I have also heard argued in Beijing two years ago (when the photo above was taken) that the Chinese today have much of what the students had demanded in the way of freedom, openness and economic liberalisation, and that paradoxically and painfully, the Communist Party may even have had a certain justification in putting down (although in a disastrously violent way) some very firm boundaries in 1989 in a country whose history is one of at times cataclysmic instability. Do listen. 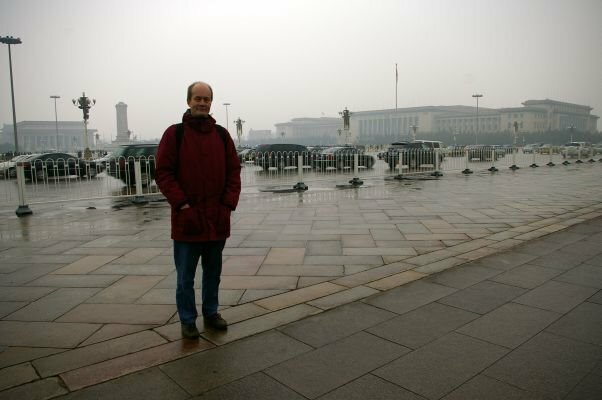 And if the impact of Tiananmen Square, like an old trauma, still burns for you, you might find interesting accounts this week of the newly-smuggled memoires of China’s late reformist Party leader Zhao Ziyang, banished from power at the height of the demonstrations in 1989 for arguing the students’ case for tolerance. But back to cataclysm, as Barack Obama lays out sadly inadequate but important new legislation on improving the fuel consumption of American cars, Madeline Bunting in The Guardian this week made some of the most cogent connections I’ve yet read between the current UK parliamentary expenses scandal and our much more widely shared but equally unsustainable sense of entitlement merely as inhabitants of the 21st century Western world. And this at a time when more and more publications, in tune with Madeline Bunting, are beginning to name the catastrophe that is coming our way – notably the Lancet this week, which has finally named climate change as the biggest threat to human health in the 21st century, noting that many are going to need counselling to cope with the emotional distress this will entail. I actually suspect that, when things begin to get really bad, there won’t be either much appetite or financing for psychotherapy. So, time to get cycling around the world before it’s too late?